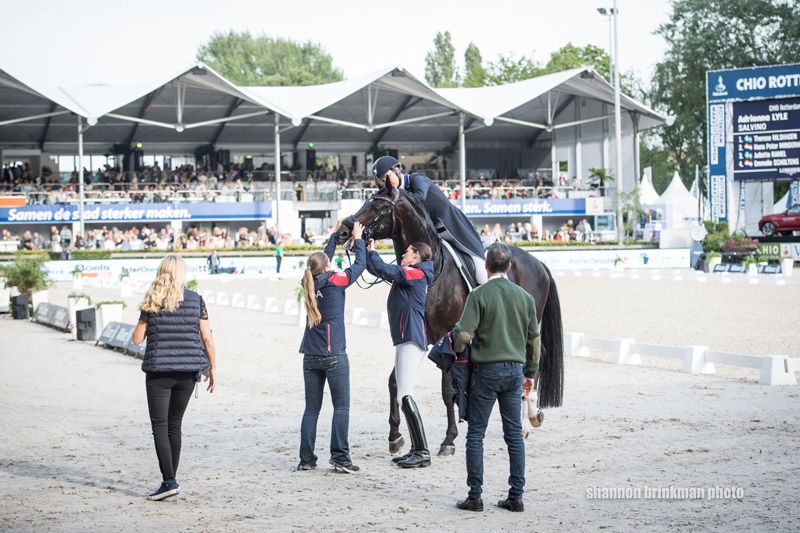 Adrienne Lyle had run through the test in her head, received her last words of advice from her coach, and was just waiting for the bell to ring for the Grand Prix Special in the FEI Nations Cup at the CHIO Rotterdam (the Netherlands) on June 23, when things abruptly went pear-shaped. Upon entering the Rotterdam Arena, Salvino’s noseband broke. Whoops! Something’s not quite right there. Photo by Shannon Brinkman. It was all hands-on deck from there, with Lyle’s groom Morgan Klingensmith and members of the Dutta Corp. U.S. Dressage Team scrambling to fix the faulty tack. “My groom always has extras of everything; anything you might need in case of emergency,” said Lyle. “[The noseband] wasn’t the right size for him; it was just an extra we had in the bag, so we had to make some quick adjustments to get it on in time for them to let me go back in. It was all hands on deck to help get Salvino’s noseband swapped out before Adrienne Lyle’s test. Photo by Shannon Brinkman. 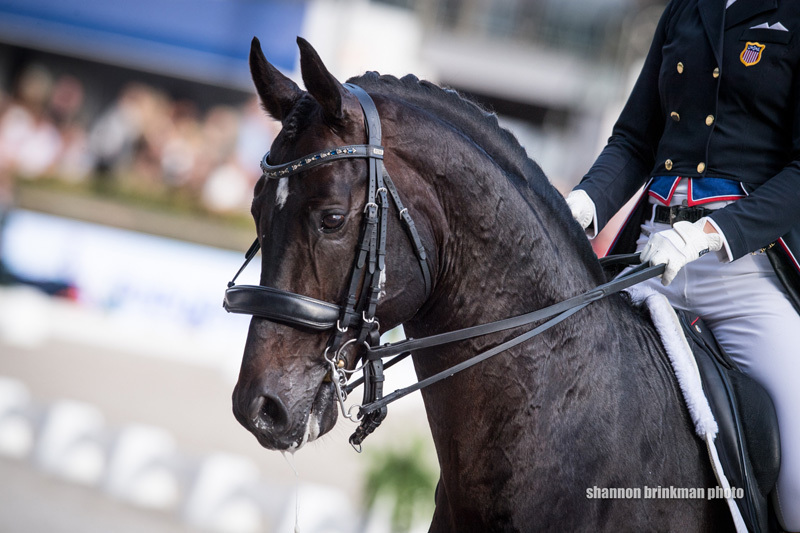 With the pressure already on—the competition doubled as an observation event for a team spot for the 2018 FEI World Equestrian Games (North Carolina)—the 11-year-old Hanoverian stallion (Sandro Hit—Dynastie, Donnerhall) managed to hold it together for a final score of 71.91 percent. At the end of her test, Lyle, 33, Ketchum, Idaho, gave Salvino a pat on the neck, a rub of the ear and a kiss to reward him for his cooperation. The Dutta Corp. U.S. Dressage Team, comprised of Lyle on Salvino, Olivia LaGoy-Weltz on Lonoir, Kasey Perry-Glass on Goerklintgaards Dublet, and Steffen Peters on Rosamunde, finished in third place in the Nations Cup competition.